The story of the Battle of Leyte Gulf in World War II-the greatest naval battle in history. As Allied ships prepared for the invasion of the Philippine island of Leyte, every available warship, submarine and airplane was placed on alert while Japanese admiral Kurita Takeo stalked Admiral William F. Halsey's unwitting American armada. It was the beginning of the epic Battle of Leyte Gulf-the greatest naval battle in history. 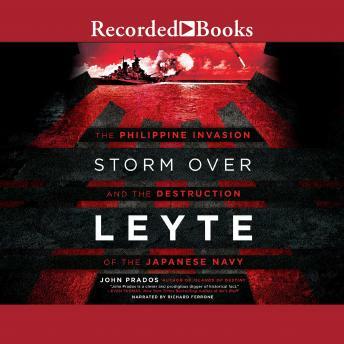 In Storm Over Leyte, acclaimed historian John Prados gives readers an unprecedented look at both sides of this titanic naval clash, demonstrating that, despite the Americans' overwhelming superiority in firepower and supplies, the Japanese achieved their goal, inflicting grave damage on U.S. forces. And for the first time, readers will have access to the naval intelligence reports that influenced key strategic decisions on both sides. Drawing upon a wealth of untapped sources-U.S. and Japanese military records, diaries, declassified intelligence reports and postwar interrogation transcripts-Prados offers up a masterful narrative of naval conflict on an epic scale.